A show at Eco Fashion Week, a feature in FLARE magazine, and now, his 1000th bag. 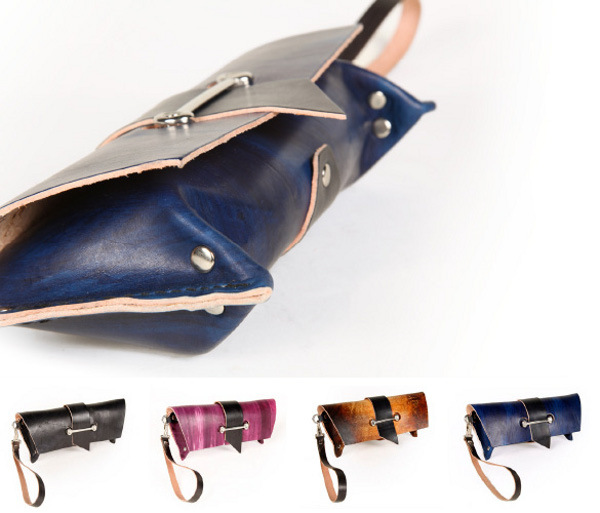 Bag and leather goods designer Lincoln Heller of Fiveleft Leather has accumulated some impressive milestones during his career. 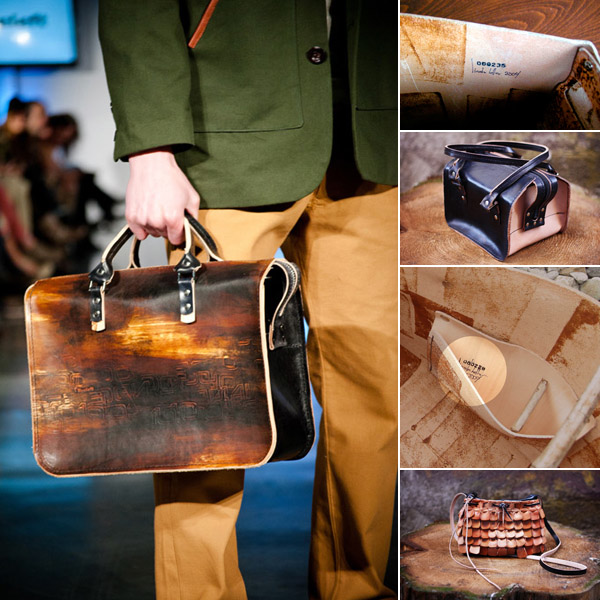 All of his bags are made by hand in Vancouver and come with individual serial numbers. But the 1000th bag--a boxy black-and-white carry-all satchel--is extra special. So special, in fact, Fiveleft is hosting an auction and party on November 3rd at the Robinson Studio Gallery in its honour. Fiveleft is doing something else to celebrate: offering one lucky Solo Lisa reader a Leashed Clutch (valued at $120, pictured above) in red, light brown, or black. This statement wristlet boasts the best of Fiveleft's design signatures: colourful treated leather, sleek and structured lines, interesting hardware. To enter the giveaway, simply comment on this post by Friday, November 2nd, 12pm PST, and answer this question: "Guess who just made their 1000th bag?" Entries must have some means of contact (email, blog, or Twitter). Good luck! UPDATE: The winner of the giveaway is Natalie (@OceanScented)Congratulations! Love love love that clutch by Fiveleft! Been dreaming of the rust one forever :) Lincoln Heller of Fiveleft Leather just made his 1000th bag, can't wait to see it! I have met Fiveleft Leather at Event in September. It was beautiful color and design!!! Fiveleft has been my on "dream" list for a while now. So excited Lincoln Heller (of Fiveleft) has made his 1000th bag. I'm going to guess Lincoln Heller? Been Following this guys work for years! Great stuff! Can't wait to see the 1000th bag! Lincoln Heller of Fiveleft Leather! Gorgeous work! Lincoln Heller of Fiveleft Leather of course! I dream of owning one of his bags, but alas this student budget isn't big enough for such a lovely purchase. Thank you so much for the giveaway! The answer is Lincoln Heller of Fiveleft Leather. I love the spunky yet polished style of the clutch, it has a strong personality that I would be proud to display along with my outfit of choice. Lincoln Heller of Fiveleft. I have to say I love a red bag. Lincoln Heller of Fiveleft Leather! Those bags look beautiful! Lincoln Heller of Fiveleft Leather! Lincoln Heller of Fiveleft Leather!! What great designs! Answer: Lincoln Heller of Fiveleft Leater. It's Fiveleft Leather's Lincoln Heller! Will you be attending the Nov. 3 auction & party? I'd love to hear how it goes! Gorgeous bags!!! The 1000th bag was made by Lincoln Heller of Fiveleft Leather! designer Lincoln Heller just celebrated his 1000th bag! A: Lincoln Heller of Fiveleft Leather. Michael's briefcase was made by Licoln and I love it. 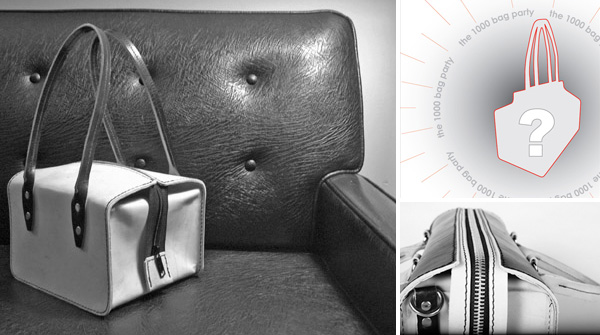 Lincoln Heller made his 1000th bag: a boxy black-and-white carry-all satchel.